Three brothers have stumbled across a deep sea giant on a beach near the country’s capital Wellington. Their sassy photo shoot with the creature, uploaded to an account belonging to a local diving group, has made a big splash among commentators stunned by the scary find. 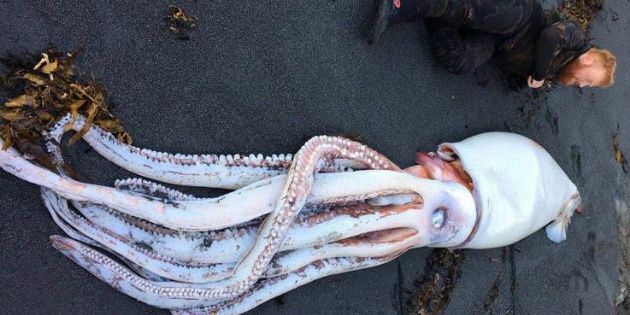 Divers Daniel, Jack and Matthew Aplin spotted the big whitish creature with giant tentacles while searching the coastline south of New Zealand’s capital Wellington for a place to swim. “My brother said ‘what’s that over there?’ and pointed it out. It was right next to the track so we pulled over and we were like: ‘It’s a big squid’” Daniel Aplin said as quoted by the local outlet NewstalkZB. The men have reportedly encountered sharks in the area before, but it’s the first time they’ve seen a giant squid. Why the creature had washed ashore and ended its days this way, isn’t clear. “It was pretty clean, nothing major on it. There was a scratch on the top of its head but smaller than a lighter, tiny, wouldn’t think that’s what killed it,” one of the brothers said. The men, described as “big dudes,” looked dwarf-like when they took several snaps alongside what has been identified as a 4.2-meter-long giant squid by the Department of Conservation, according to the brothers. The photos with the giant squid have been uploaded to the Ocean Hunter Spearfishing and Freediving Specialists’ Facebook page and made a splash among netizens. The initial post received thousands of likes and comments, while the snaps soon went viral.